Beds&Drinks v Miami, USA: Zarezervujte nyní! Hello and welcome to Beds N Drinks; the one and only hostel in Miami Beach with FREE DRINKS and 5 hours of happy hour every day. Salud! And let’s have a drink to celebrate this great news! With this we honor our name by providing you with the most comfortable beds and the tastiest cocktails of all hostels in South Beach. Only at Beds N Drinks, you have the wonderful opportunity to start your evening off by meeting up with your fellow hostel-mates where you receive a free drink upon check in. Our free drink offer will then be followed by the best happy hour in the area where you can purchase creatively crafted cocktails at an unbeatable price. More than just free drinks and happy hour, we organize parties and events for you that include VIP access to Miami’s most prestigious clubs or simply take it easy, stay back, sit on our gorgeous patio or front terrace, listen to music, relax and make some new friends and enjoy a drink from our bar. We also encourage you to take advantage of our discounted student rate tours to explore Miami, we have a great variety of deals for you to get to know the area but if you want you can always take in Miami Beach at your own pace and just hop on one of our bikes and tour it. Out staff can help you sort out pretty much anything you may have in mind so stop by our front desk as we will take great care of you. Our hostel is the ONLY fully renovated art deco building on the beach which means you are lucky to enjoy the eclectic mix of historic and new in a very unique way. 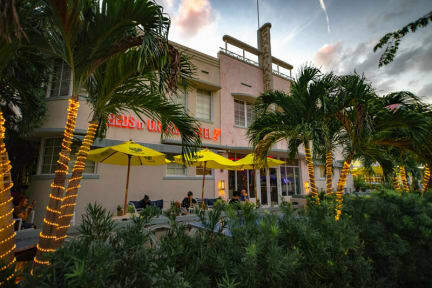 Proud to be the only hostel next to (literally 50 ft.) from the famous Lincoln Road Mall and only 2 blocks from the beach. What this means for you as a guest is that you can enjoy Miami Beach at its best without having to spend any money taking any type of transportation as everything is steps away. Yes! We offer free breakfast, we want you to have a little something to start your day and if you want to get fancy, we have healthy items for purchase such as freshly made acai bowls and pancakes all at budget rates. And don’t worry about searching for the perfect coffee place to wake you up in the morning. Our baristas are skilled experts at waking you up with delicious concoctions to start your day off right. Yes! We offer a shuttle service from the Miami International and Fort Lauderdale International Airports at discounted rates for our guests and can pick you up any day at any time. Just make sure to contact us with your flight details ahead of time so we can safely transport you to the best hostel on the beach. In closing, our sole purpose is to make your stay remarkable and we want it to be unforgettable. Our staff is here to assist you 24/7 so you make the best of our time here in Miami Beach. We take pride in maintaining an extremely clean property in both the rooms and the common areas. This property will preauthorize your credit card prior to arrival for the first night of your stay plus tax in order to guarantee you reservation. 20 USD deposit will be charged at check-in for the room key card, bed number and towel. 10 USD will be charged against your deposit for lost key card, bed number or towel. Any cancellation must be done by email (cancellation over the phone is not accepted). To avoid any charge, you need to get a confirmation email from the hostel. Please note that during special events and holidays, any cancellations made within one week of the date of arrival will be charged 100 percent of two nights. Prices quoted do not include 14% tax this will be added to your bill upon check in. There is an additional resort fee of $5 per person per night for the dormitories and $4 per room per night for the private rooms. Payments made on property with a credit card will have an additional 5% processing fee. We are an international traveler's hostel and welcome traveler's from out of the country or state.